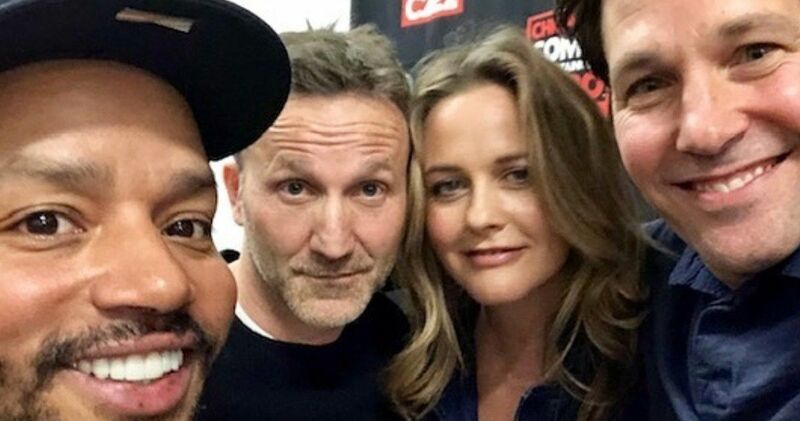 The cast of Clueless got together at Chicago’s C2E2 expo this weekend to celebrate the 24th anniversary of the classic movie. Paul Rudd, who is approaching 50-years old, doesn’t seem to age and, thanks to fellow castmate Breckin Myer, we may now finally know why. Rudd and Myer appeared on stage with co-stars Alicia Silverstone and Donald Faison and talked about making the movie along with Brittany Murphy, who sadly passed away ten years ago. Stacey Dash did not join the cast this weekend. While taking questions from the enthusiastic crowd, Paul Rudd was asked how he never ages. The Avengers: Endgame star quickly quipped, “I’m 80-years-old on the inside. It’s a mess underneath all this.” The response got a laughs from his fellow Clueless castmates and the audience, but Breckin Myer took it one step further in explaining Rudd’s youthful looks. He explains. Breckin Myer’s response received even more laughs and Paul Rudd simply said, “Hey, it’s a tough business.” Myer was obviously kidding around, Rudd doesn’t really consume blood from babies, so we’re still left wondering just exactly how he remains so youthful. The Ant-Man star also talked about how much fun it was to meet Stan Lee. In addition to joking around about Rudd’s looks, the cast of Clueless spoke about Brittany Murphy. Alicia Silverstone said that she was perfect for the part and Rudd remembered how sweet she was on and off the set. Silverstone had this to say. Breckin Myer says that Brittany Murphy was “ridiculously talented.” The two worked together again on Mike Judge’s King of the Hill and Myer noted that Murphy could do it all, “She could sing, she could dance.” Murphy passed away in December of 2009 from what has been described as an accidental overdose of prescription medication. Alicia Silverstone posted a picture of the reunited Clueless cast to social media and revealed that her male co-stars were making her laugh throughout their day on and off the stage. After all of these years, it’s nice to see that the cast still enjoys being around each other so much. This isn’t the first time that they have gotten together and it will definitely not be the last time either. You can check out the some of the photos from the Clueless reunion below, thanks to Alicia Silverstone’s Instagram account.
.@donald_faison: Do you remember, y’all took me out for my 21st birthday? @AliciaSilv: *I* was there?!? Paul Rudd: Do you remember *anything* about making this movie? ?